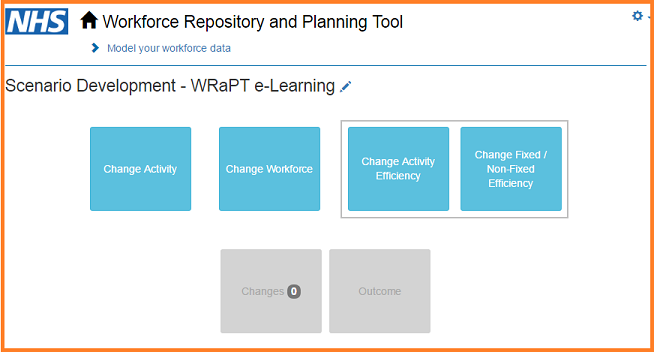 This e-Learning training course is designed to teach you how to prepare, upload, explore, edit and model your workforce data using the cloud based Workforce Repository and Planning Tool software. What data does WRaPT need to work? 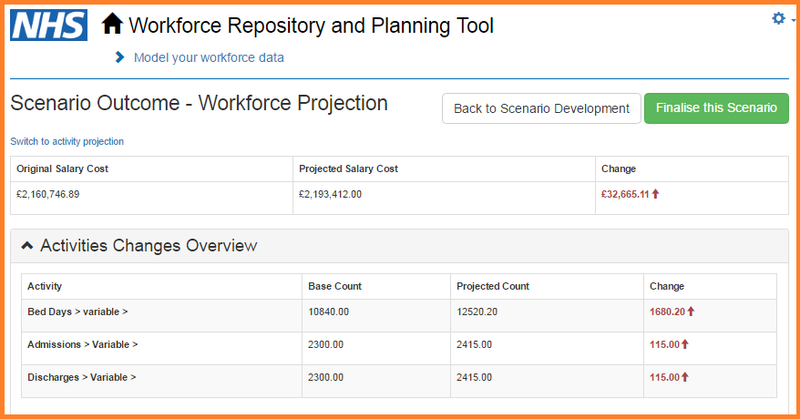 Workforce Data - Where Does It Come From? This can come from any workforce data repository. 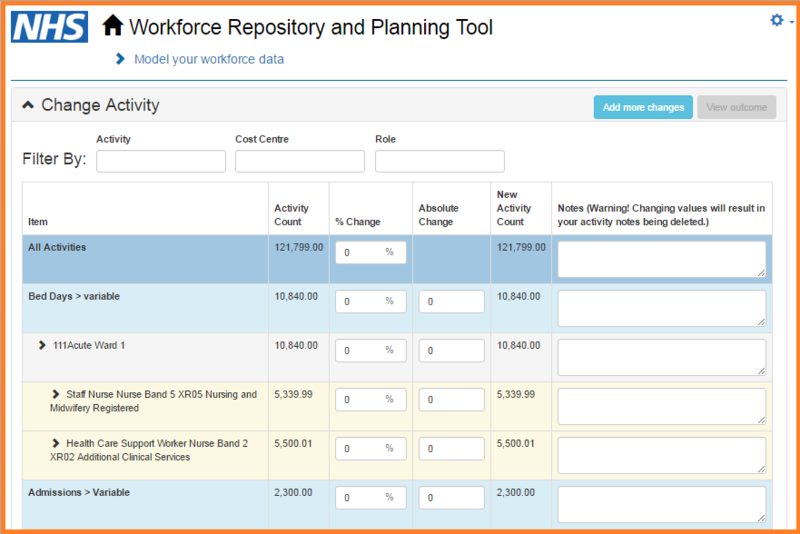 WRaPT uses an Excel template to input the workforce data a copy of which can be downloaded here. 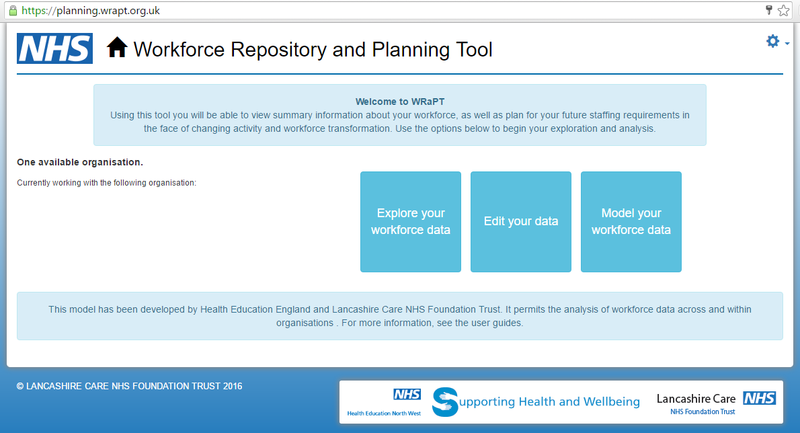 If your organisation uses ESR, the workforce data can be provided for WRaPT using the publicly available ESR template. In order to access the ESR template, you need to ensure that you are set up on ESR with 'Disco Ad Hoc' URP and have 'Discover Public User' role enabled, then you should be able to search for 'WRaPT' and find it. This is what the spreadsheet looks like when it contains data. We have included dummy data to elaborate. 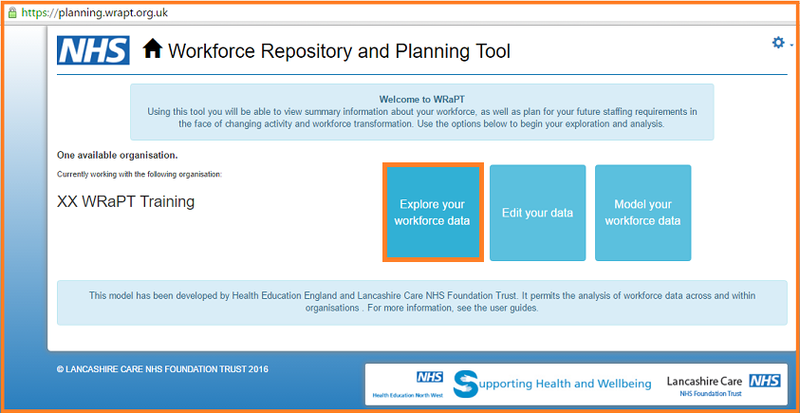 Workforce Data - What Information Is Mandatory? What is the mandatory information required? This information is mandatory however it is pseudonomised as part of our Information Governance/Data Protection responsibilities. We also collect some protected characteristics to assist organisations with their equality impact assessments, further details of which are on the next page. As part of the public sector, if your organisation is undertaking a service redesign there is a legal obligation to perform an Equality Impact Assessment. The WRaPT team gathers the above protected characteristics (in blue) outside of the web tool to produce a Workforce Baseline Report. 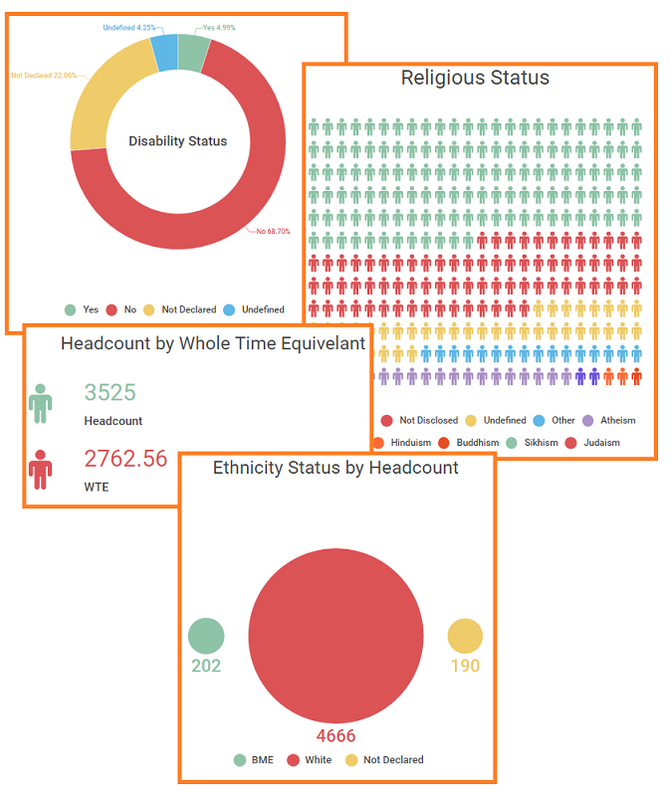 As part of this we are able to perform that Equality Impact Assessment for you and an example of some of the infographics that we are able to provide to your organisation are shown below. Gender and Year of Birth (Age) are the most important of these. Please note that we do NOT collect names within the tool. The Role Group ID is a concatenated field made up from specific elements of the workforce file. A concatenated field is the process of joining two or more fields together to create a new field. 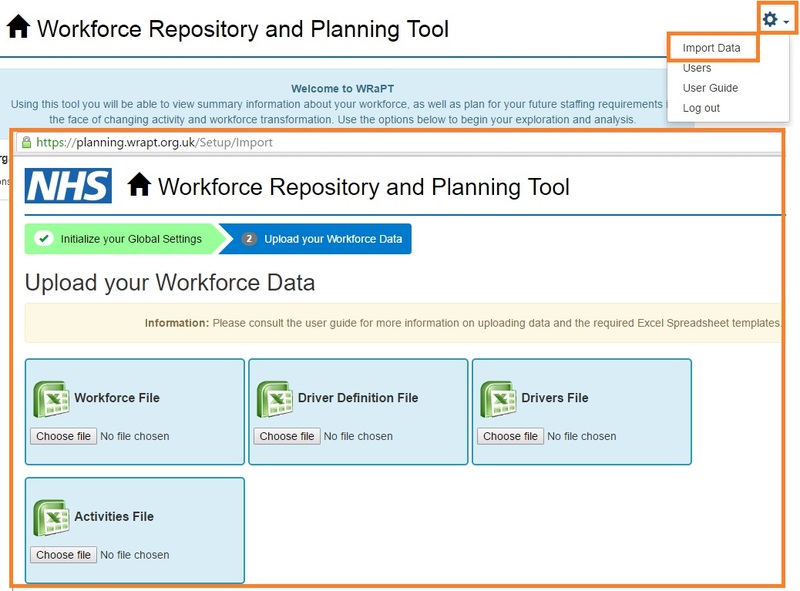 The Role Group ID creates a unique role identifier which is used to link workforce data to driver data. Further details regarding driver data's use of Role Group ID can be found on page 10. Click on the hot spots of the below image for more information on where this information is drawn from. Activity Data - What Is This? Activity data is any activity that a team does in one year. This may be recorded as bed days, number of scans, number of home visits or clinic appointments or any other consistently recorded activity that accurately reflects what a particular team (cost centre) does. Obviously, accurately recorded data produces the best results but the activity input for WRaPT depends very much upon the questions that you want WRaPT to help you to answer. Selecting an activity that reflects the work done by a team or group of teams, can be as simple or complex as you choose, there are many ways to view this. The WRaPT team can work through this with you to identify a measure that you feel is indicative. Activity Data - How Is This Gathered? How is the activity data gathered? All activity counts are recorded as an annual number to avoid seasonal variation. The WRaPT activity spreadsheet template can be downloaded here. Driver Data - What Is This? The ‘driver’ data links the activity with the Workforce. It does this by breaking down the amount of time, as a percentage, that each role spends doing an activity. 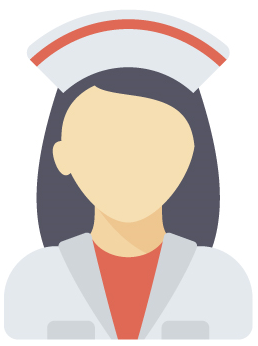 An admin worker for example would spend 100% of their time on administration, whereas a band 3 support worker may only spend 10% of their time on administrative activities and 90% on clinical activity. Each role divides its time between the activities recorded for the relevant cost centre, with up to 6 different types of activity that can be assigned to each role. This activity must equal the descriptions given in the activity data set. Each role’s assigned activities must add up to 100%, as driver data is representative of the activities a role performs as a whole, with each separate activity forming a percentage of this. Driver Data - What Data Is Required? What data is required for the driver data input? The ‘Role Group ID’ is identical to the concatenated field in the workforce data and thus serves as a robust link between the two data sets. The activities that are related to the roles are listed in this spreadsheet with the percentage time that the role spends on those activities. The WRaPT driver spreadsheet template can be downloaded here. What is the difference between fixed and variable drivers? A fixed or variable 'driver' relates to the type of activity a role performs and this is recorded as a'contact type'. Time related to a variable contact type can flex up and down in the scenario modelling phase with any activity or efficiency changes made. Fixed drivers relate to time that does not have a direct impact on the activities that you are analysing. Any driver or proportion of a role’s time that is allocated to a fixed driver cannot be adjusted in the scenario modelling phase. Examples of fixed time might be protected study time, admin or management duties that do not flex with variable activity being modelled. Consequently, any amount of time allocated to a ‘fixed’ driver will NOT be proportioned against a reported activity, and any outputs from a scenario that adjusts activity, will not include the fixed time requirement. Consequently, in practice we find it better to create all drivers as ‘variable’. For example, if you had 20% of a role assigned to a fixed activity and 80% to a variable one, when you adjusted this variable activity in your scenario, your new required WTE would NOT allow for the fixed proportion of that role and may therefore give you a skewed view of your requirement. Driver Definitions - What Are They? The driver definitions file provides the final piece of the puzzle by listing each unique appointment and contact type. This is essentially the contact type and appointment type from the existing activity data. The role ID is a concatenated field held in which data set? Driver Definitions - How Are They Recorded? How do I record the driver definitions? The driver definitions file is a spreadsheet which lists each unique appointment type and contact type. A copy of the spreadsheet can be downloaded here . This is what the spreadsheet looks like when it contains data. We have included dummy data to elaborate. The column 'Specialty' is not currently in use. You must use ESR to be able to upload your data into WRaPT, it’s just a health tool. The WRaPT team produce a Workforce Baseline Report which facilitates the creation of an Equality Impact Assessment. Please choose the three types of data sets which WRaPT primarily needs in order to scenario model data. The following statements relate to activities done by the teams on your activity file, try to pick out the activity data and align it to the correct teams. 70% of District Nursing Home Visits are follow ups. As a surgeon my time is split between surgeries, outpatient appointments and administration. Spending 15% of my time completing administration and 25% of my time dealing with outpatient appointments means that I spend % of my time in surgery. Please complete the sentences with the correct ending based on the information in Chapter 1. The 'Role Group ID' is a concatenated field held in which data set or sets? Following the completion of Chapter 1 you should now know what WRaPT's data requirements are. If you have any other queries please do not hesitate to review content on our website, contact the WRaPT team here, book on to one of our group training sessions or undertake the e-Learning again. We value all feedback we receive in relation to our training and would be grateful if you could take a few minutes to complete our survey which is accessible at the end of Chapter 3. The above is the log in screen for the current version of WRaPT. Please note that the access permissions will be based on your organisation or group, and your organisation or group must have a data sharing agreement in place (even for single organisations) in order for access to be granted. Please see the Information Governance area on our website for further information. When uploading data, you should select a file that is in the correct format based on the Excel spreadsheet templates – if you upload a file that is not in the correct format then the data will not upload correctly. For this reason it is recommended that you use the example spreadsheet templates provided through the website or Chapter 1 of this e-Learning course. There are some mandatory fields that must be included – and many more fields which are not mandatory. The details of these fields are set out in Chapter 1. The tool will not accept any variation or omitted mandatory fields or incorrect or missing column headings. Large files may take some time to load. While the system is loading, you will see a waiting screen. If you see an error message preventing the upload this will usually ask you for the issue to be resolved in the upload file before trying again. Later on, warn you if expected data is incomplete (e.g. activity supplied but no drivers are associated with it). As you can see in the example, all cells where there is an issue will be listed so that you don’t have to keep loading, problem solving, loading, problem solving etc. If there is no error, the screen will show that the data has been uploaded successfully. These errors can be exported as an excel file, so you can check the source data before uploading. Not using the template faithfully, i.e. making sure that all column headers are in the upload sheet in the correct order. Org 6 (team name) has more than 1 cost centre associated with it. This is a problem if the same name in the org 6 column has 2 or more costs centre codes in the respective cost centre column, or if 1 cost centre code has more than 1 team name. The value in “budgeted FTE” and “WTE” columns are not the same (copy and paste before upload). The “salary value” and “cost budget value” are not the same value throughout. At any level; from a single cost centre to the overall health economy, WRaPT can report on the “As Is” situation of the workforce. It provides the ability to create, store, change and download any combination of data. This facility can be used with workforce alone, or the entire data set if it is available. 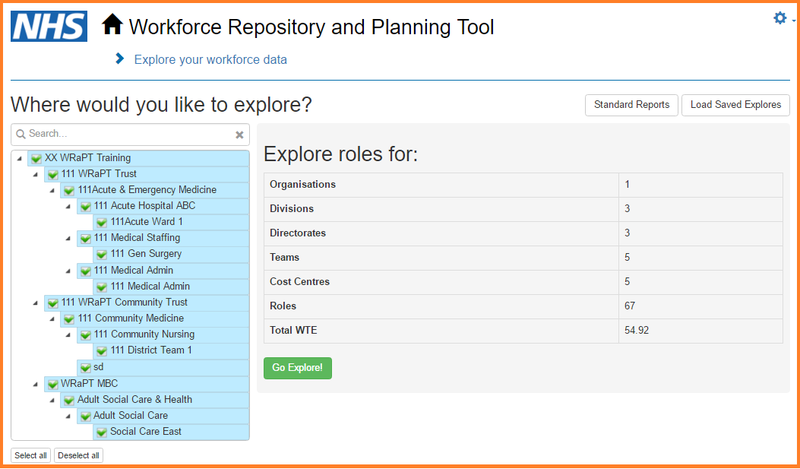 From the home screen you can select to 'explore your workforce data'. Which takes you to the screen shown below. Data can be edited within the tool however any upload of revised data sets will overwrite the changes. For this reason we advise that any editing is done in the base data prior to upload. 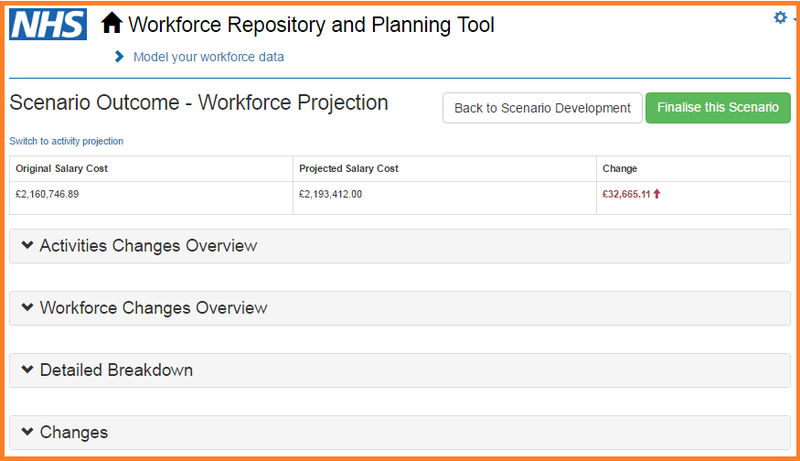 which gives users the option to edit organisations, driver definitions, roles/drivers/activities or benchmarks. Further details regarding editing data in the tool will be forthcoming after the next rewrite of the tool. Until this time we again advise all users to edit the base data prior to upload. Please click on where you would navigate to to get back to the home screen? 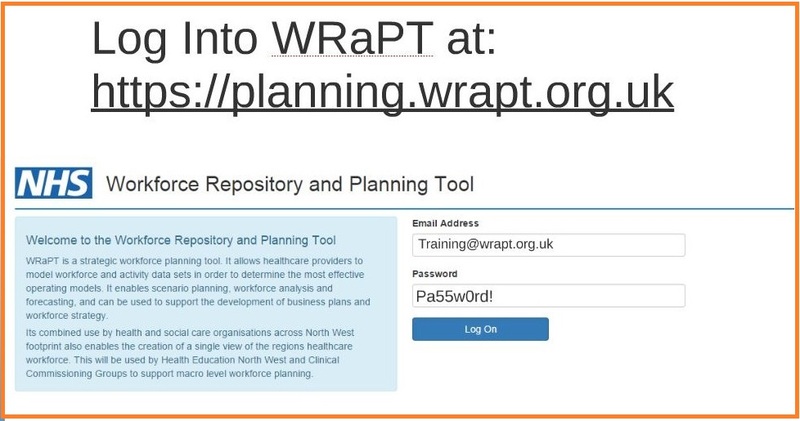 In order to answer the next questions regarding exploring the data, you will need to log into WRaPT here and using the training log in details below. There are grade 9 staff working for Social Care East. The total number of roles recorded for WRaPT Training organisation are . healthcare assistants work for the WRaPT Community Trust. The Cost Centre to which the Position Title 'Support Worker' belongs to is . Following the completion of Chapter 2 you should now know how to navigate around WRaPT. If you have any other queries please do not hesitate to review content on our website, contact the WRaPT team here, book on to one of our group training sessions or undertake the e-Learning again. The ability to use all this data to create scenario modelling is where this tool can add the most value. 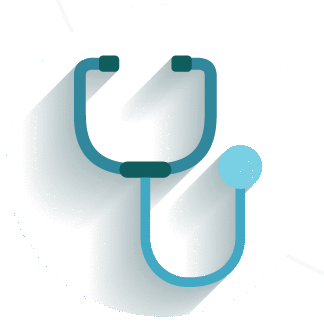 Whether you need to remodel a single team or analyse service provision throughout an entire health economy, WRaPT can provide valuable insight into how your workforce and their corresponding activity might look in any given scenario. 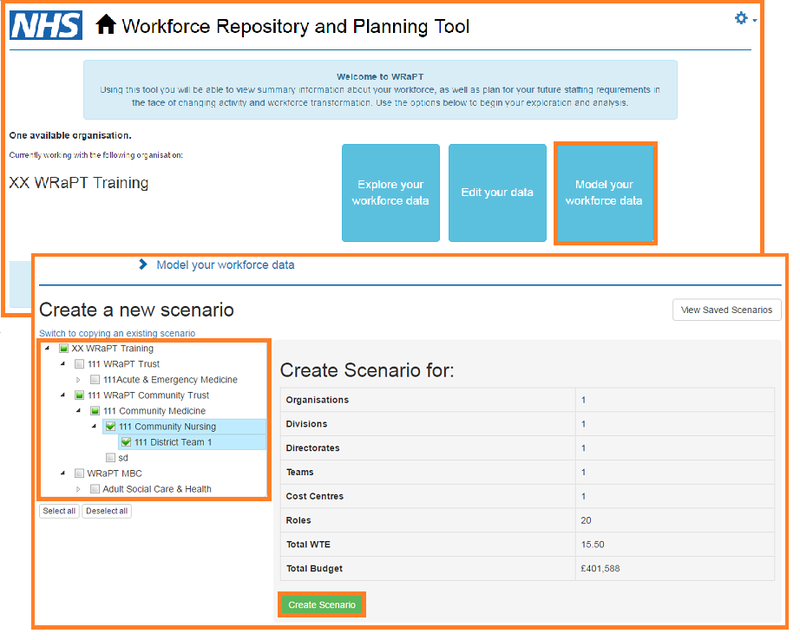 Once you have given your scenario a name you will reach this screen which enables you to navigate to the changes you wish to model. This screen allows you to change the activity done by roles either within individual cost centres, or groups of cost centres. If for example you wanted to change ‘all activities’ with a percentage increase or decrease, this change would be made pro-rata against each role based on the driver information. i.e. it proportions the change based on the amount of variable activity that a role does. Scenarios can be built at any level, from a singular change in one role type, to system wide adjustments or any combination therein. In the same way that a percentage or absolute change can be applied to the activity, adjustments can be made to any level of the workforce. This section uses the input from the benchmarking area. Changes in this section apply to the amount of activity, i.e. the ‘driver’ associated with a particular role. If for example you increased the patient facing activities/reduced the administrative functions of a particular team, because you wanted to see the impact of the introduction of a dedicated administrator to assist multiple teams, this is where you would be able to adjust for that expectation. When you view the outcome the page is split into sections and as you expand each section you will be provided with additional detail. Scenario: The Acute Trust sees a high number of older adults suffering from injuries as a result of trips & falls. The Acute Trust, in collaboration with the Local Authority and the Community Trust are planning to implement a new Integrated Falls Service to improve care as well as cost effectiveness. Scenario Modelling 1: Patients will be offered additional support to enable them to be discharged sooner, the Acute Trust expects this will save 3940 Bed Days. The cross economy workforce lead has asked you to model this in WRaPT and report the outcome to them. The absolutepercentage change to bed days would be +3940-33%+33%-3940 giving an overall savingadditional spend of £ . There would be an increasea decreaseno change to the admission and discharge numbers to Ward 1. With regards to the workforce the newly projected WTE required for the Healthcare Support Worker roles are and Staff Nurse roles are . Scenario: The Acute Trust see a high number of older adults suffering from injuries as a result of trips & falls. The Trust, in collaboration with the Local Authority and the Community Trust are planning to implement a new Integrated Falls Service to improve care as well as cost effectiveness. The Community Trust has advised that due to the new early supported discharge programme some patients will require extra support from the District Nursing Team, resulting in a 10% increase in Home Visits. The cross economy workforce lead has now asked that following the earlier changes made they would also like to know what the additional spend and staffing would potentially be required if this change was also made. In order to implement the changes the Community Trust will need to recruit an additional WTE Community Nurse and WTE Healthcare Assistant. Following the initial saving of £58,424.58 the additional spend will therefore be £ per annum on these additional roles. The Local Authority has advised that in an attempt to prevent readmission the Social Care East Team has agreed to carry out 500 additional Safety Assessments. The cross economy workforce lead has asked you to advise how this further change affects the overall funding from current spend and any additional staff required and associated costs. In order to implement the overall changes there will need to be overall increase the current spend of £ , with £ being spent on an additional WTE Occupational Therapist grade 9 role and WTE Occupational Therapist Support Worker grade 5 role. Following the completion of Chapter 3 you should now know understand how to use WRaPT to model scenarios. If you have any other queries please do not hesitate to review content on our website, contact the WRaPT team here, book on to one of our group training sessions or undertake the e-Learning again. We value all feedback we receive in relation to our training and would be grateful if you could take a few minutes to complete our survey which is accessible at the below link. Clicking on 'COMPLETE SURVEY' will open a new browser window.